It’s from the multiple listing from 1965 when we had it on the market at the time. We were asking $9,900, and couldn’t sell it! For the most part, all the houses were white then. 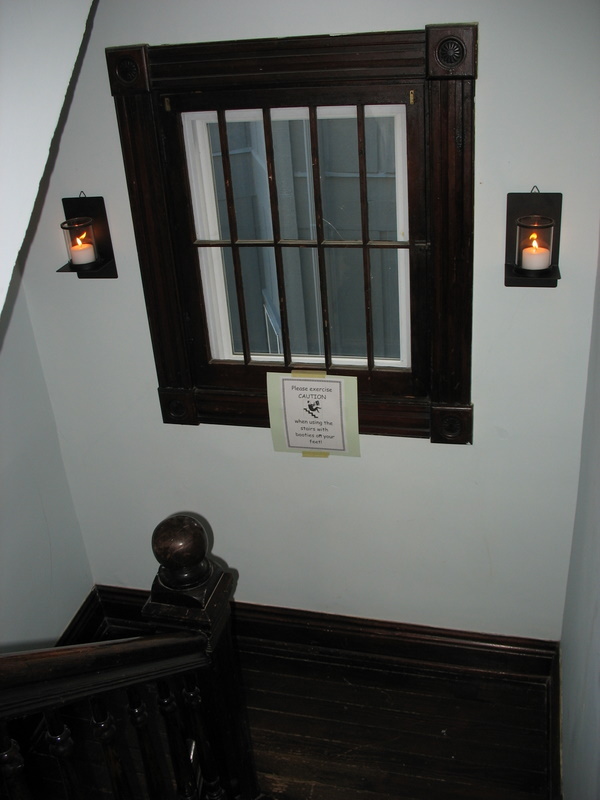 “Two houses up from us, where the condos are now, was a beautiful big Italian Gothic house. Three old sisters lived there, Ida, Kate and Meadow. They used to talk about driving in their ‘machine.’ Meadow was always out in her straw hat gardening. The house opened up onto a courtyard, from where stone terraces festoned with flowers rose up the hill to a wooded area in back. Too bad it was ripped down for condos in the 70’s. That was a crime. The paint on the Steamboat Gothic row homes across the street, which were apartments, had completely worn off, and with brown wood exposed, looked derelict. We kids always thought houses like that were haunted, and walking home from school, we would run by them. And there were a few in the neighborhood. Somebody finally painted row houses with one coat of white and sickly green trim that soaked right into the wood. Back in the day nobody really did appreciate the heritage of old homes. It must have been a combination of lack of disposable income, coupled with a post war attitude that new was good, old bad. But the residents of Tusculum fought ripping down that old Italian Revival to slap up condos. A band of aroused Columbia Tusculum residents won a skirmish against a bulldozer Wednesday night in their battle to block a condominium development. An estimated 30 residents surrounded and stopped the bulldozer which was trying to make it’s way from Tusculum avenue up a hillside that backs up to Alms Park. Gilbert ”Doc” Owens, another neighborhood resident said the sad story is when the city stands by and lets a money hungry developer put up condominiums in at the base of a beautiful park with no consideration of the young people (who are rehabilitating old homes in the area) who want to make this city and live in this city. As I walked through the neighborhood this fall, I was sad to think of all the historic homes that had been bulldozed, but when you look around at all of the beautifully restored Victorian Painted Ladies on that hill, you realize that the developers lost in the end. 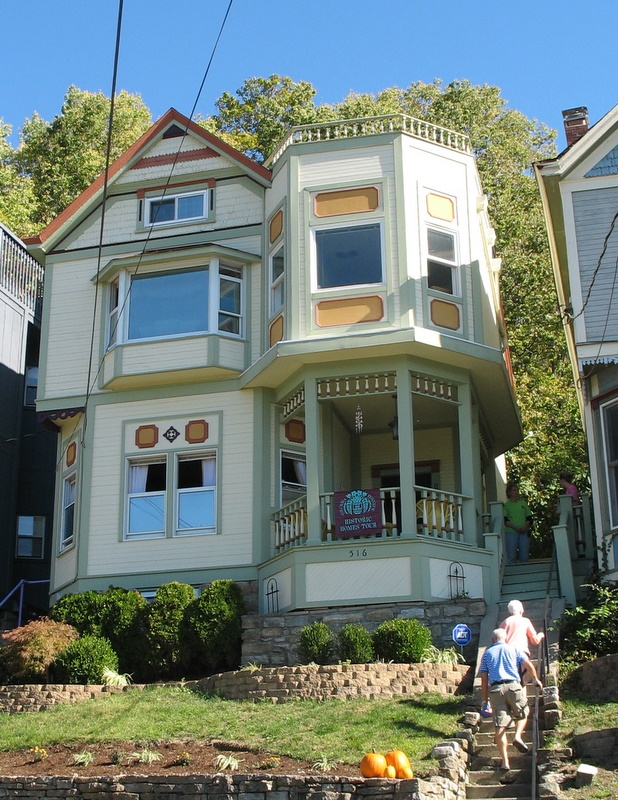 It’s a thriving community now where the majority of homes have been lovingly restored. The rehabbing homeowners won the war. 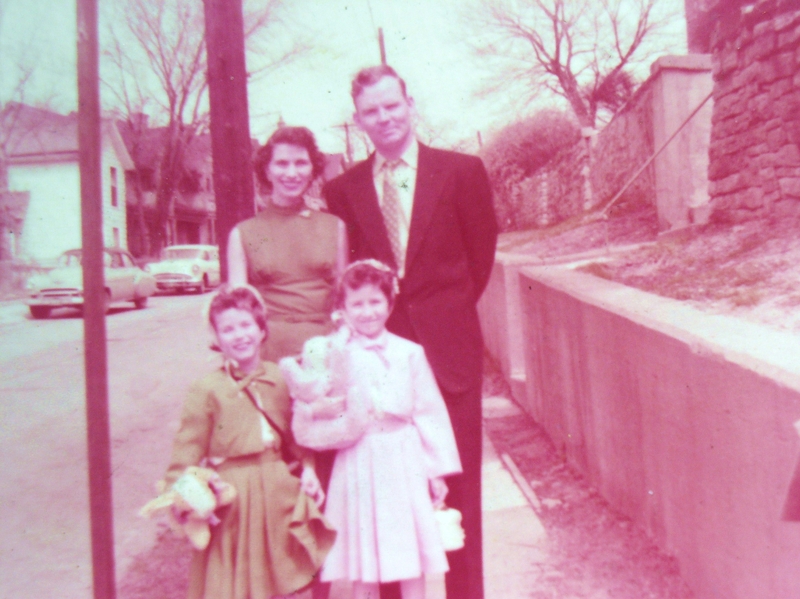 Here’s a picture of Valerie’s family standing on the sidewalk outside the house on Easter 1956. Don’t you love old photos like this? Big thanks to Valerie for sharing her photos and memories with us! It made the house tour even more fun for me. 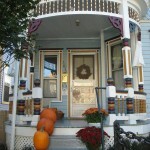 To see more photos from Valerie’s old neighborhood, click here, or check out yesterday’s post. I have some more house tours from Columbia Tusculum to show you in days to come, so stay tuned! Planning a remodel of your own? 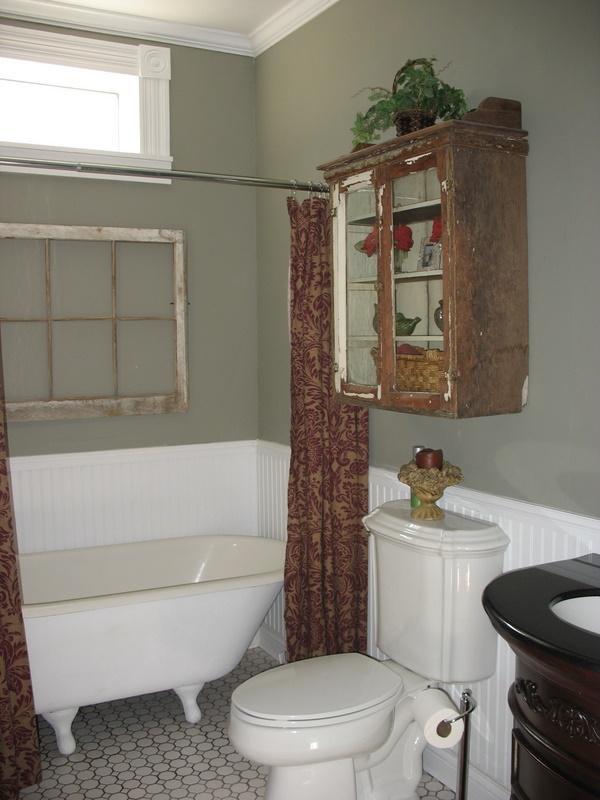 You can find remodeling contractors and get free remodeling estimates at CalFinder. A Remodeling Risk I Regret Taking! What a pleasure to see this childhood home loved and restored — and what a relief. My dad’s childhood home in Pasadena is now condos. Thank goodness for the old photos. Ok, maybe I’m tearing up b/c I love old houses. Maybe it’s the two pounds I gained yesterday. Maybe it’s PMS. But whatever… this post was SO touching. This is such a treasure. I just love old homes and I LOVED seeing this one ‘now’ how it has been redone. What a wonderful place.. Thanks for the pictures, very inspiring! What a cool post. A big thanks to Valerie. Thank you so much for this post. 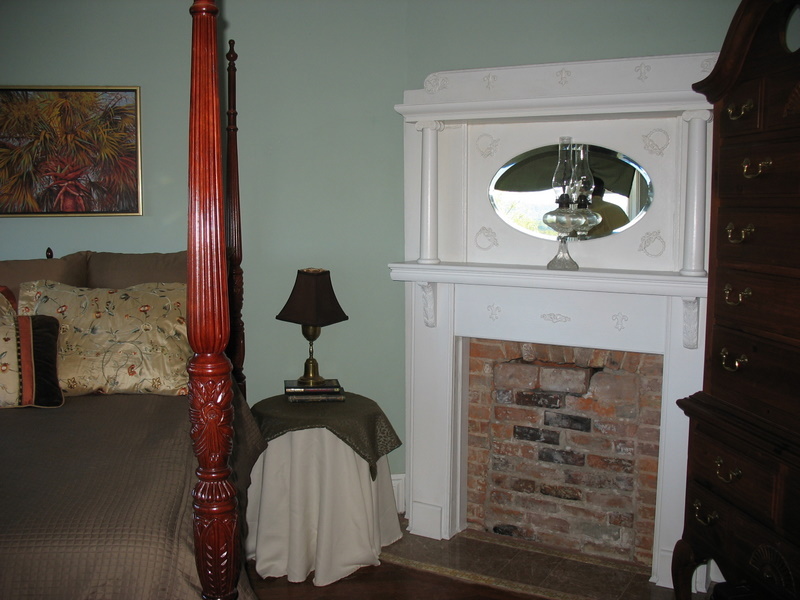 I love old homes (I am working on a historic preservation degree because of this reason). I have a question for you: Can you see this neighborhood from I-75? 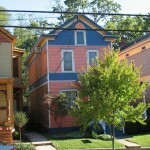 I have traveled frequently from AL to MI and I have admired a colorful neighborhood while passing through Cincinnati. Just curious. Thanks again for posting. 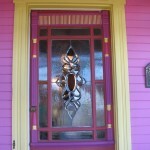 Great post-what a fun story, I love learning the history of homes! Thank You~hope you are having a terrific Tuesday! Awwww. I love that she is able to see what it looks like today!! How cool is that! 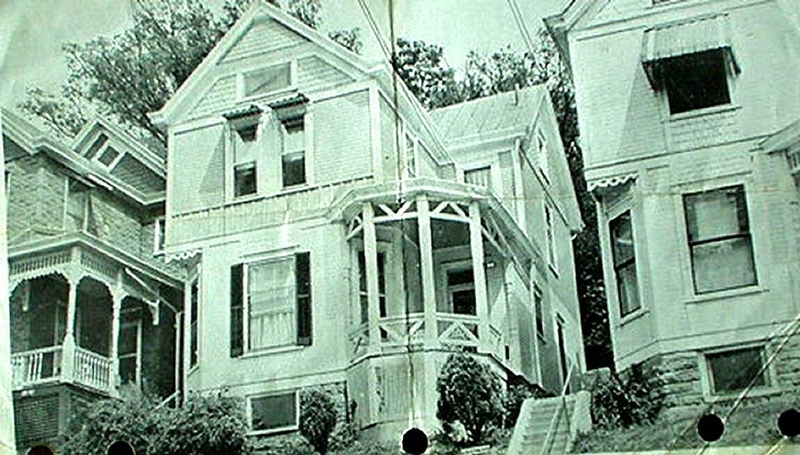 I am so happy when I see old and once treasured houses such as these saved and restored. They are so much a aprt of our country’s history. I’m so glad there was a happy ending to this story for Valerie! Wow! What a house! I so wish I could live in an old house. Instead I’m renovating a 1970’s home that has no character – I have to ADD character. This person has great taste, love the house!!! Julia, I’m not sure if you’ve ever seen the home on this website (https://ourvictorianhouse.com). It is amazing!!! Julia, that’s a lovely post. I love that Valerie shared the story and photos with you and the rest of us. What a great post! It’s rare that you see an photo and then the same house today. And how heartening that someone has so lovingly restored it. 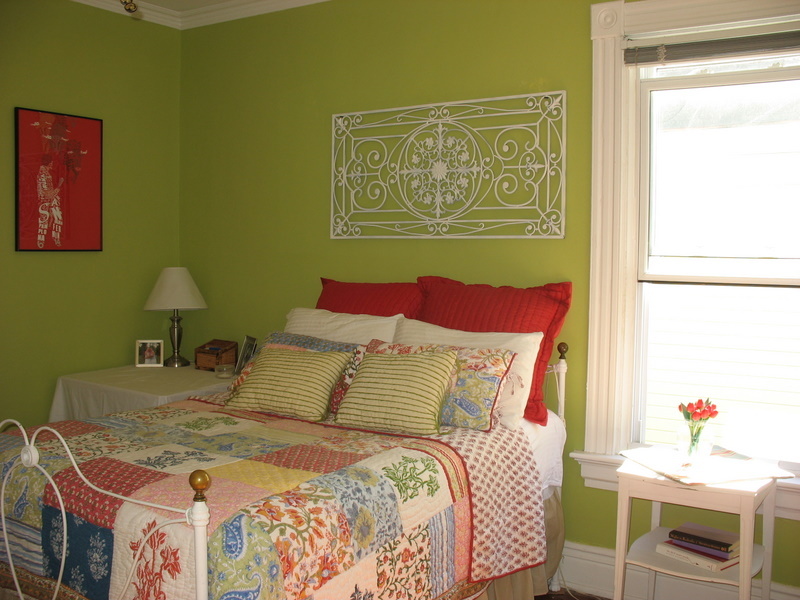 They did a wonderful job – especially love the apple green and red in that bedroom. As for the old easter snapshot – those photos always make me feel so nostalgic. What a feat just to get everyone dressed and looking so good! 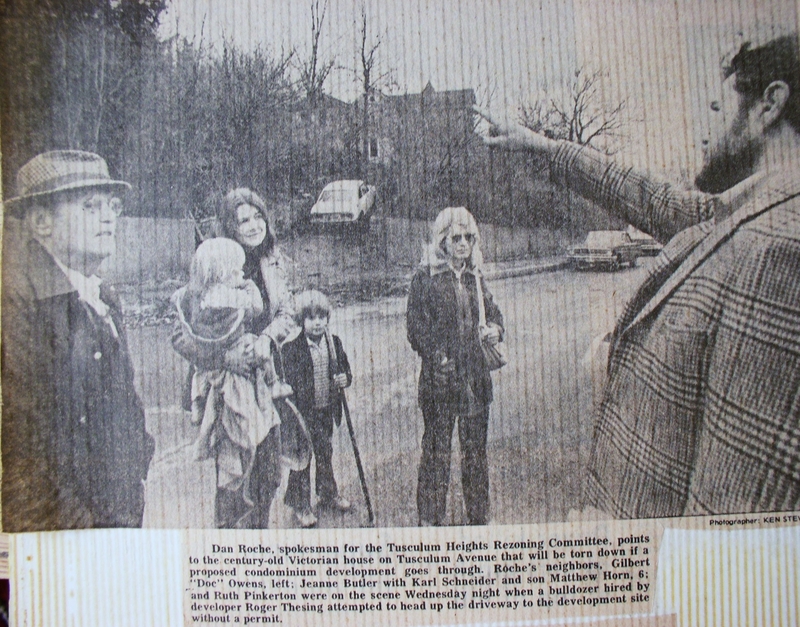 Great post….so many memories….and I am happy to hear that the neighborhood is thriving. I love the Easter photo. Thank you to Valerie for sharing the story. That is WAY cool!! How awesome to know the actual history to one of these homes!?!?! Interestingly enough, last year, my mom was going to have to sell the house that my grandparents and greatgrandparents lived in. Up comes my cousin who wants to buy and renovate it!! When I get some pictures, I’ll shoot you an email! He has done an amazing job of renovating it and keeping in the family! I’m glad to see its still around. Despite the addition of some unfortunate window replacements. The interior looks to be preserved though. Good Job! What a pretty old house! I just love seeing them renovated and history preserved too. I left you an award on my blog but I totally spaced of telling you. I’m swell like that. I love what they did with the house. Love that master bedroom. 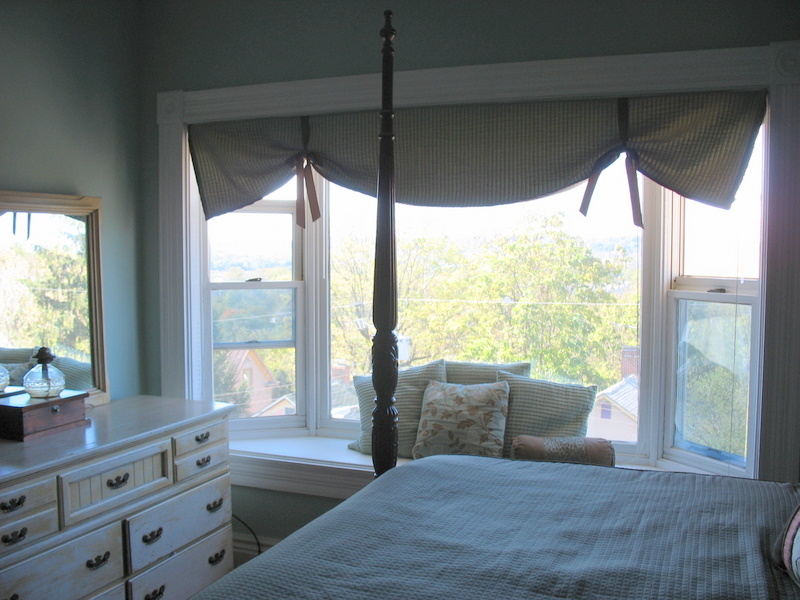 What a window seat, I’ve always wanted one in my bedroom. Oh, the books I would read while lounging there!